General Director of JSC CONCERN TITAN-2, Grigoriy Naginskiy, and the heads of all TITAN-2 Holding subdivisions attended the official ceremony dedicated to the power start-up of the new unit. The Holding’s subsidiaries have built and successfully prepared for commissioning the new power unit of the Leningrad NPP with VVER-1200 reactor. The Head of Rosatom State Corporation, Aleksey Likhachev, gave a command to start the generator synchronization with the network. In order to integrate the generator into the network, the thermal power of the VVER-1200 reactor was raised to the level of 35% of the rated thermal power while the turbine rotation speed was equal to 3000 rpm. 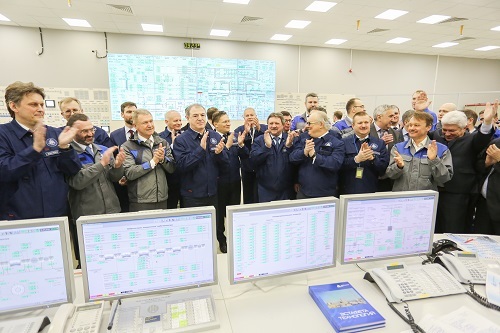 The new Leningrad NPP power unit has been integrated into the energy system at the minimum electric power level of 240 MW and shall operate in this mode for four hours, as specified in the program. It will produce the amount of electric power equal to about 1 million kW⋅h during this period of time.